On the lookout for an aggressive aquatic invader…on this CurrentCast. There’s trouble in the Great Lakes, and it’s coming from a non-native, bottom-dwelling fish called the round goby. These fish hitched a ride in the ballast waters of ships and arrived in the lakes uninvited. This grey-mottled varmint is usually just a few inches long with frog-like eyes and thick lips. It looks a lot like a native sculpin fish but has a unique fin on its underbelly. These intruders are taking over! They eat the eggs and young of native fish, steal their habitat, and reproduce like crazy. They do just fine in iffy water and can find food in total darkness. 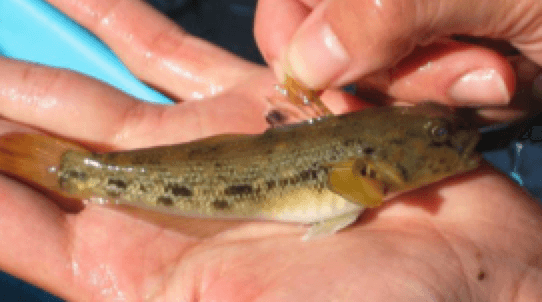 If you fish, you may spot a round goby taking the bait on your hook. So remember, if you see ‘em, report ‘em! Quagga Mussels. Short post from CurrentCast. Learn more . Never dump your fishing bait into the water. There could be non-native species in your bait. Ontario.ca notes " It’s illegal to empty your bait bucket, drain the water or release live baitfish into a lake, river or other waters. Instead, you must: drain your bucket onshore (30 metres from the water), freeze the excess minnows for another day, catch your own bait from the lake you fish in.